Our colourful stand from the franchise show. 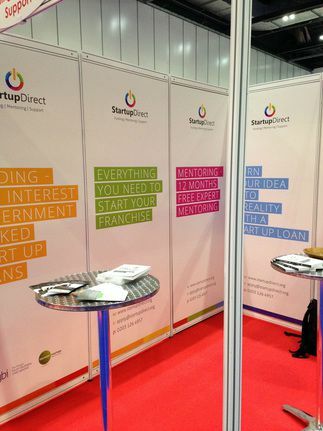 On Friday 20th and Saturday 21st February, Startup Direct was at the London Franchise Show 2015. Raj, Charlie, Tommo, James and I went down to the London Excel in South-East London and met lots of potential franchise businesses and franchisors. The show was packed full of franchisors displaying their company wares with every possible variety of business there. Potential entrepreneurs had the possibility to set up businesses selling lawn mowers to ice creams, beauty products to education services, web marketing to security produce. Charlie had organised our stand and we stood in front of huge boards. If you came, you’ll probably remember our colourful stand. We gave information to potential entrepreneurs on the 6.3% personal loan we provide to help them fund their franchise startup. Over the days we met hundreds of people, providing them with information on the Startup Loans Scheme and us, the delivery partner (who approve the loan and provide mentoring), Startup Direct. We heard about people’s business ideas, the size of the personal loan they would require and their back-stories. It was interesting meeting so many people with such big entrepreneurial ambitions. To me it showed the amount of opportunity there is here in the UK and showed that the plan by the government run Startup Loan Company, to encourage enterprise, is working as there are many people out there who want to run their own businesses. The days were busy and after talking to so many motivated people, we left feeling tired and inspired, ready to contact all the links we had made and provide potential loan applicants with the necessary next steps to help them start their franchise aspirations. Did you meet us at the Franchise Show?